Leavenworth, Washington is a theme town. Quaint Bavarian villages serve as the inspiration in terms of architecture (Tudor Revival), souvenir shop standards (cuckoo clocks and beer steins), museums (the home to 6,000 nutcrackers), and most importantly food. German sausages and sauerkraut take up a lot of real estate on restaurant menus and the annual Oktoberfest draws over 10,000 people. 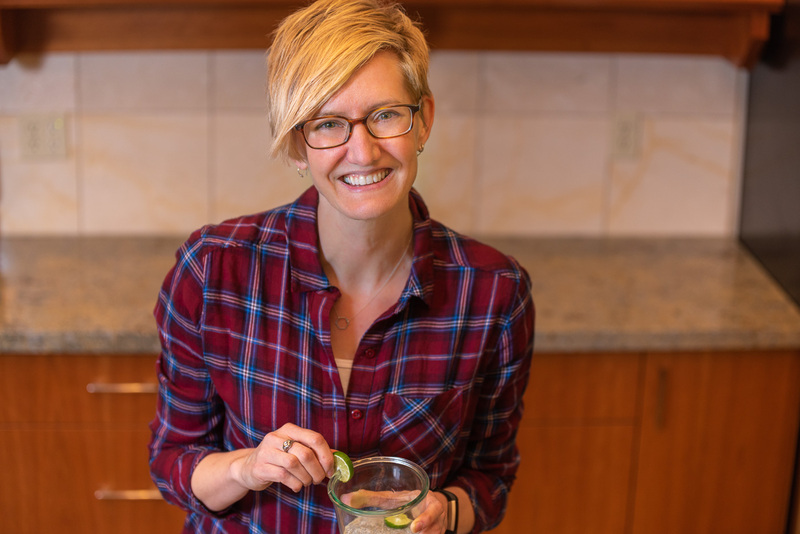 While a great destination to wander, shop, and marvel at the North Cascade range and Wenatchee River, it’s not necessarily a place I’d expect to be a haven for the meat-free crowd. But this little alpine hamlet surprised me. Pleasantly. 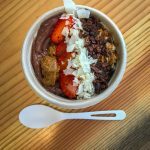 I used my handy-dandy Happy Cow app to do a little research before our trip and found three eateries that held some possibilities. One in particular turned out to be the jackpot: The Hunter’s Wife. Call it a juice bar. Call it a health bar. Either way it’s vegan and organic and an oasis of plant-based fare in a town focused primarily on tubes of meat. We were staying in a cabin in nearby Plain with our niece and we ended up eating at The Hunter’s Wife twice per her request. Our first visit was for lunch after initially arriving in Leavenworth. It was over 90 degrees and their refreshing menu of smoothie bowls and iced beverages sounded divine. 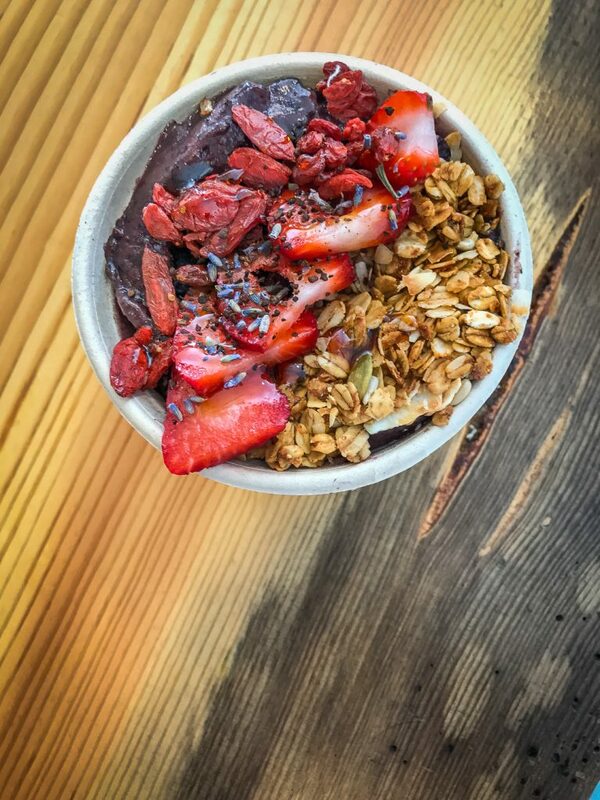 Our niece got the small Zen Bowl after being enticed by this menu description: açaí, blueberries, matcha (green tea powder), spinach, mint, banana, coconut mylk – topped with berries, goji, granola, and dried lavender. She appreciated the slight hint of refreshing mintiness and adored the floral feeling from the lavender. 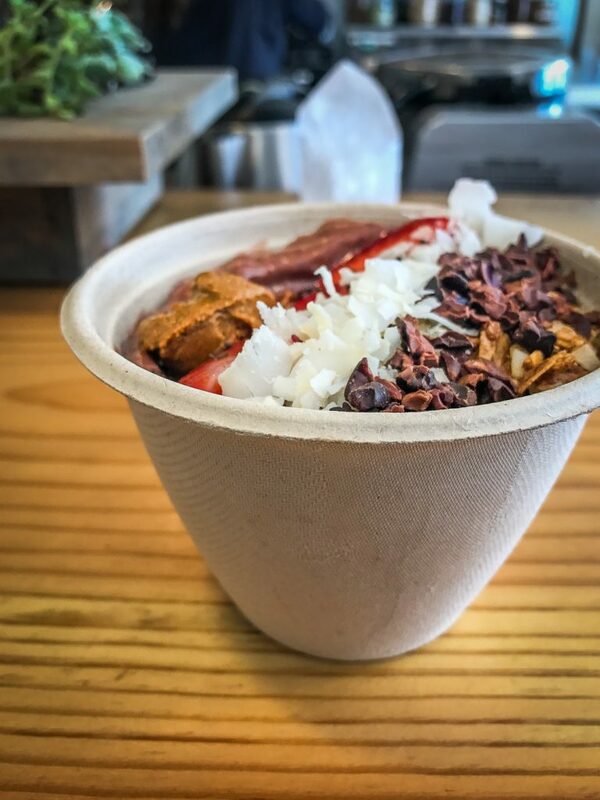 I opted for the small Dessert Bowl, because why not: açaí, banana, cacao, cashew mylk – topped with strawberries, coconut flakes, cacao nibs, granola, and superseed butter. If I can be simplistic with my word choice this was plain awesome. I was so hot and it was so cold, it was almost thirst-quenching. The toppings provided top-notch texture and the tiny little dollop of superseed butter was the best thing in my bowl. 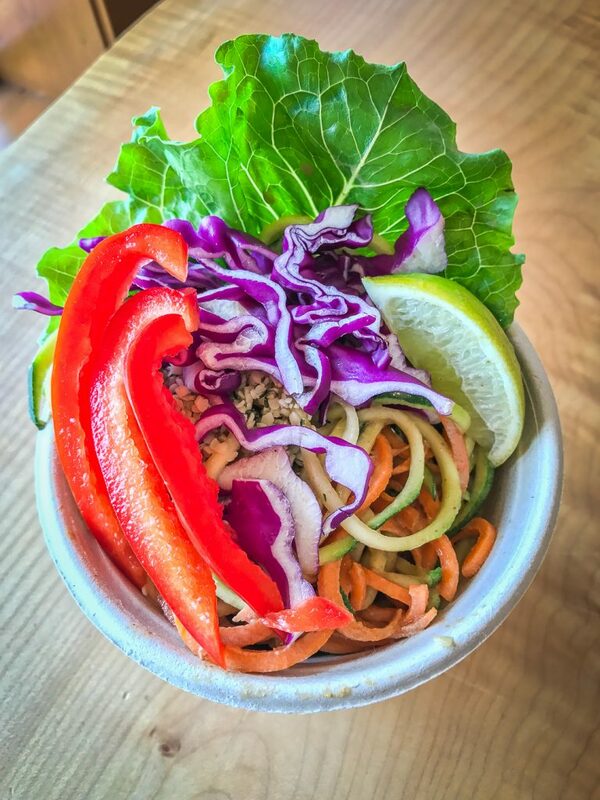 Jeff got the only option from the Savory Power Bowls part of the menu: a small Rad Thai, described as zucchini noodles, carrot ribbons, cabbage, bell peppers, hemp seeds – dressed with a ginger/lime/superseed butter sauce. He was a big fan of the dressing, the crunchy goodness offered by the peppers and carrots, all packed into the little paper bowl with a kick of spiciness. It was so vibrant and appetizing, I took this artistic shot too. My smoothie bowl was refreshing as all get out but I was still desirous of a beverage. I decided to try their herbal coffee. It’s a caffeine free product called Dandy Blend and its made of dandelion root, chicory root, barley, rye, and sugar beet. 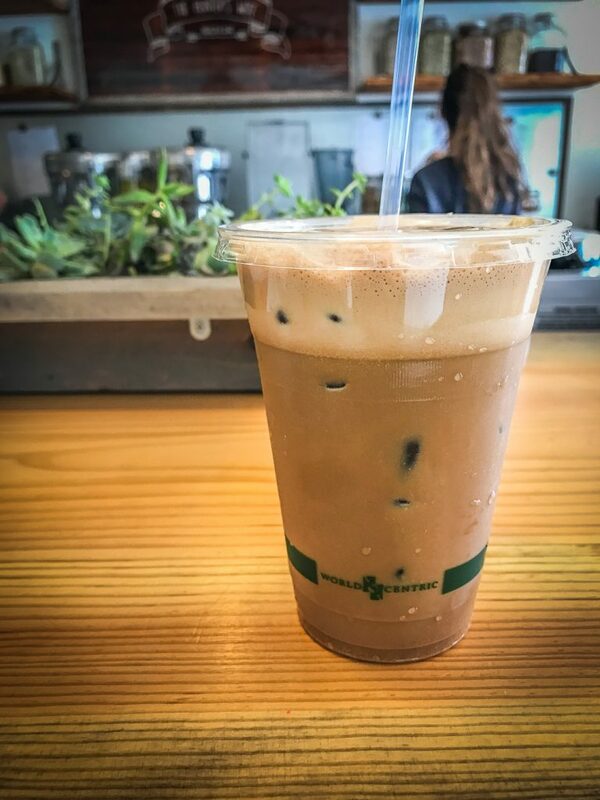 I got an iced Just Dandy: Dandy Blend herbal coffee, cacao, cashew mylk. My first impression was that it was very mild, but the flavor built with each sip and I found it to be quite satisfying. I could not stop sipping, and it was gone before I knew it. A fan of spices, Jeff got an iced Turmeric: turmeric, cinnamon, black pepper, dates, cashew mylk. Again, it was mild but pleasantly so, and very reminiscent of a chai latte. All this healthy refreshment was a wonderful way to start off our weekend away. We made dinner at the cabin, and headed back into town in the morning to stroll the streets of this tourist town. When given the option of Starbucks, The Hunter’s Wife, or Sandy’s Waffle and Dinner Haus, the niece led us back to the health bar in search of a morning smoothie. I got the Mystic Matcha: matcha, banana, cacao nibs, mint, dates, cashew mylk. It was pale green, and to me it tasted like a chocolate mint milkshake and let me tell you, they did not skimp on the nibs. I chewed more than I typically do with a liquid breakfast. Sweetness wasn’t the overriding characteristic, which I so appreciate. 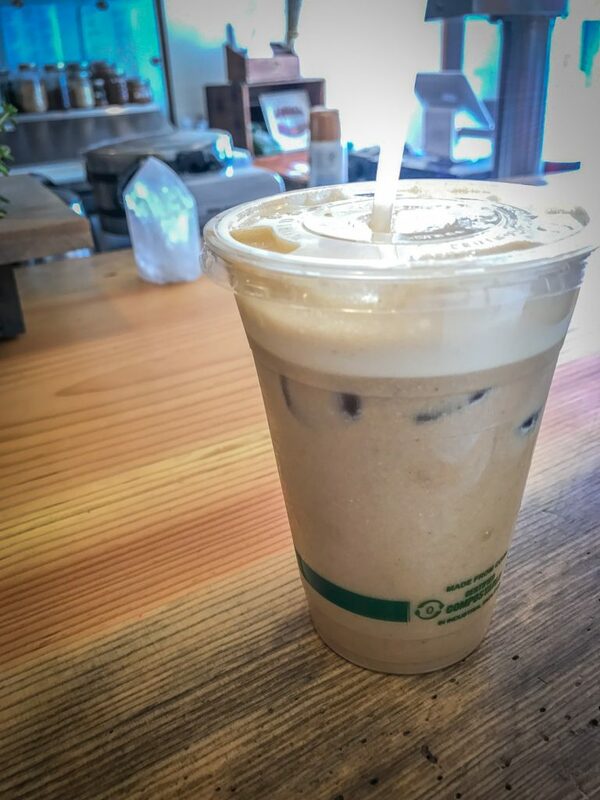 Jeff got the Maca Malt: maca (a dried, powdered root vegetable with a malty flavor), superseed butter, dates, banana, vanilla, cashew mylk. Lucky for him, the predominant flavor was the superseed butter so he happily made slurping noises until the cup was empty. 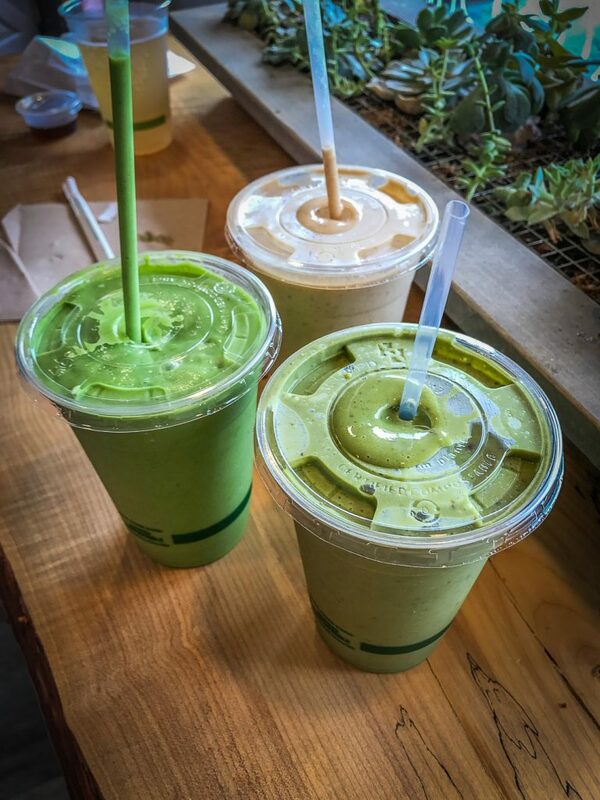 The niece ordered the Endless Summer: cucumber, avocado, pineapple, spinach, mint, fresh lime juice, coconut mylk. She said it was intensely creamy and had a big smile on her face. I think she was content with her choice of breakfast destinations. 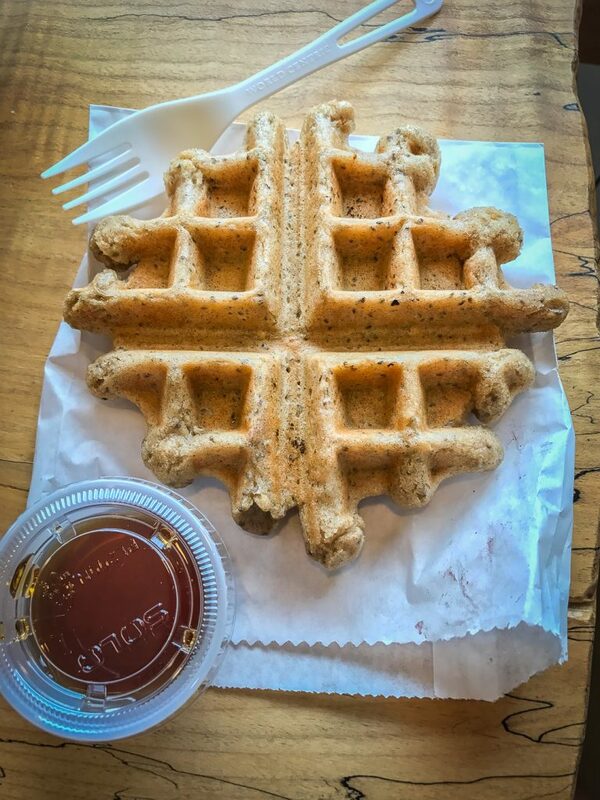 I, however, was not content with just a beverage to start my day so I also ordered a vegan, gluten-free, made in-house Classic Waffle with maple syrup. It was dense, but successfully so, and simple. Typically when we make waffles at home I add layers of peanut butter, berries, and syrup and dig in with a fork. But I thoroughly enjoyed the basic grain-like flavor of the waffle as I tore off hunks and dipped it in my syrupy syrup. And as a dietitian, I must commend them on their portion sizing for both items. I know what you’re thinking. All this colorful, fruit- and veggie-filled food must come at a price. And you’re right. The 16 oz. 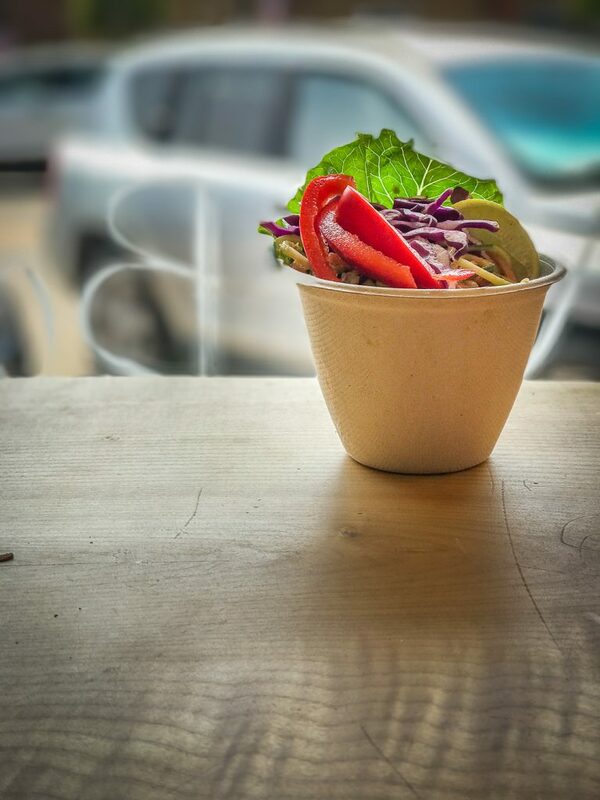 bowls ranged from $8.00-10.00, the 16 oz. smoothies were $7.00-8.00, and my waffle was $5.00. I must say, though, I was happy to support a vegan business with my restaurant dollars and thrilled to find blueberries, zucchini, and avocado in a town that mostly celebrates smoked pork products. 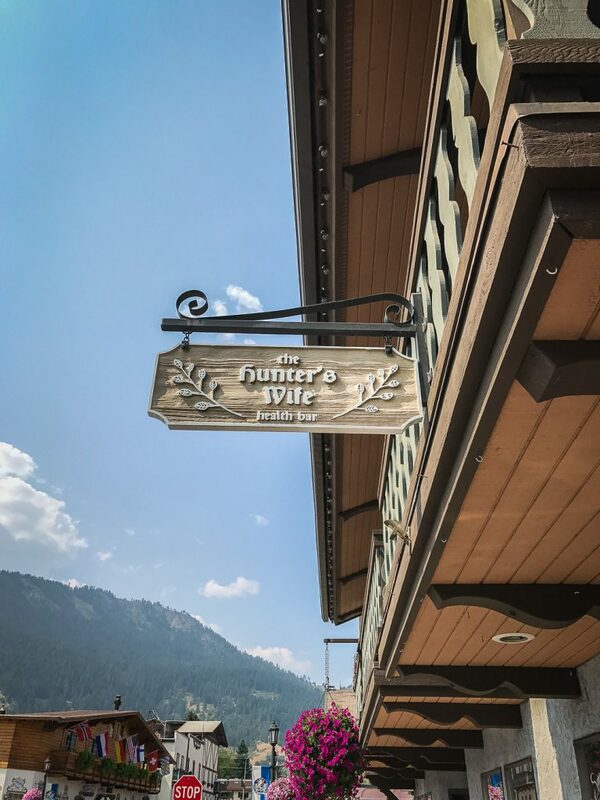 In case you’re looking for something more hearty, or if you need more than a single restaurant to make your veggie-friendly visit to Leavenworth complete, I have a couple other suggestions. We got a quick bite at the very popular München Haus. They serve Field Roast vegan smoked apple sage sausage as their Vegetarian Wurst that you can load up with kraut and mustard, and Warm Bavarian Pretzels with Beecher’s cheese sauce for dipping. The staff at The Hunter’s Wife recommended another local restaurant, Good Mood Food, which is going on my list for next time. Three meals out in three days made for three cheerful vegetarian travelers. And I learned a valuable culinary lesson: don’t judge a theme town’s cuisine by its meaty knockwurst-loving reputation. Have you found any hidden vegetarian or vegan treasures among Leavenworth’s schnitzels, brats, and kielbasas? What a great find! That herbal coffee sounds quite intriguing, and I love the gorgeous photos of the bowls.